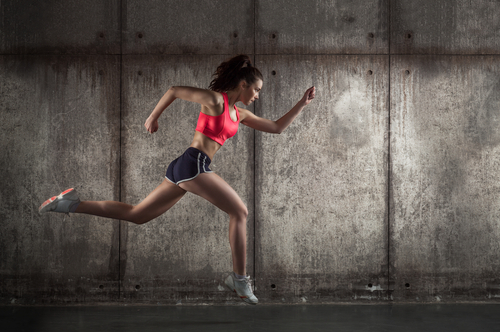 Sprinting is not traditionally thought of as being part of a ‘weight loss’ program. Traditionally, sprinting was left for athletes and long sessions pounding the treadmills were prescribed for people wanting to lose weight. Weights were feared by women because of course they would ‘bulk up’. Of course, we know now this is not true and that sprinting should in fact be included in most weight loss programs. Increase fat loss in smaller periods of time. Sprinting is a more effective use of time and gets the heart rate up higher and asks muscles to work harder in short bursts. There is evidence to show, for example, that 6 sprint sessions of 6 x 30 seconds (sprint) with 4 minutes rest in between, performed over 2 weeks, can reduce waist size! Sprinting can induce an increase in muscle mass because it works the fast twitch muscle fibres more than the slow twitch muscle fibres. With the right nutrition and recovery this can be an awesome formula for increasing lean body mass, which in turn increases your metabolism. I don’t know about you, but anything that makes me burn more energy while sleeping is a win in my books! Sprint training has been linked to increased sensitivity and improved blood glucose levels. It can also reduce inflammation, all of which can help with weight loss. And I’m not talking about the pain in your legs. I’m referring to EPOC, or excess post exercise oxygen consumption, where your oxygen consumption after the exercise is ‘excessive’ and that creates a greater fat burn. While this may not seem like a direct impact on weight loss, think about this…sprint training makes you give everything you have in a short period of time. With steady state training you can take it easy and it’s not that noticeable. With sprint training you have to give 100% in that time and it’s easier to do because you know it’s short lived. This means you are giving more of yourself and you will find that other sessions are easier so you can train harder. That’s a weight loss win!